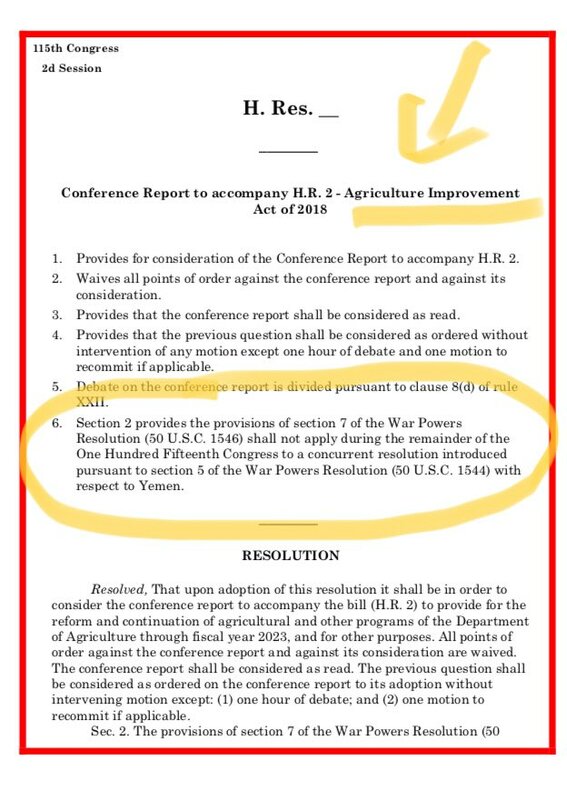 House lawmakers approved on Wednesday a proposed set of rules governing the Farm Bill debate after it was revealed to obtain a provision that blocks votes on the Yemen conflict. Lawmakers have quickly moved on the Agriculture Improvement Act of 2018 since the final version of it was released on Monday. The Senate passed it on Tuesday before it moved along to the House for consideration. Some lawmakers called out the unrelated provision in the proposed rules — but it still ended up narrowly passing 206 to 203. “Does your congressman know what’s hidden in a procedural vote on the Farm Bill today?” Rep. Thomas Massie (R-Ky.) tweeted before the vote on Wednesday. The provision within the proposed rules would specifically prevent lawmakers from forcing a vote for the rest of this year on any resolution that attempts to cut off support for Saudi Arabia in Yemen. Rep. Ro Khanna (D-Calif.) and Massie have been leading a coalition trying to push a vote to remove troops in Yemen. “I urge my colleagues to vote against the rule because the Republicans couldn’t help themselves and had to insert this Yemen issue into this rule,” Rep. Jim McGovern (D-Mass.) said from the floor right before the vote. The Farm Bill comes after months of bipartisan discussions to draft a final version of the legislation. President Donald Trump has expressed his support for the measure and is expected to sign if it gets to his desk. He said the bill was in good shape and farmers will be well taken care of; the House is expected to pass it Wednesday. The legislation over the years has generally provided farmers with crop insurance, subsidies and loans. Disaster relief provisions apply generally and there are subsidies for specific agricultural industries. The legislation has also been split with funding for food stamps as well, officially called the Supplemental Nutrition Assistance Program (SNAP). By a vote of 206 to 203 congress just flushed our War Powers down the toilet. SAD!